Double the fruity flavor, double the deliciousness. 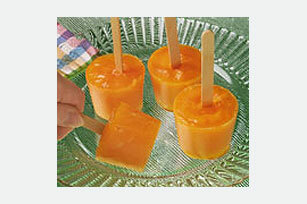 That's the best way to describe these frozen pops made with JELL-O and orange-flavor drink mix. Mix gelatin mix, drink mix and sugar in medium bowl. Add boiling water; stir 2 min. until completely dissolved. Stir in cold water. Pour into 12 (5-oz.) paper or plastic cups. Freeze 2 hours or until almost firm. Insert wooden pop stick or plastic spoon into center of each cup. Freeze 3 hours or until firm. Remove from cups before serving. Omit sugar. Prepare as directed, substituting 1 cup of your favorite flavor KOOL-AID Sugar Sweetened Drink Mix for the unsweetened KOOL-AID. Non-metal frozen pop molds can be used instead of the paper or plastic cups.